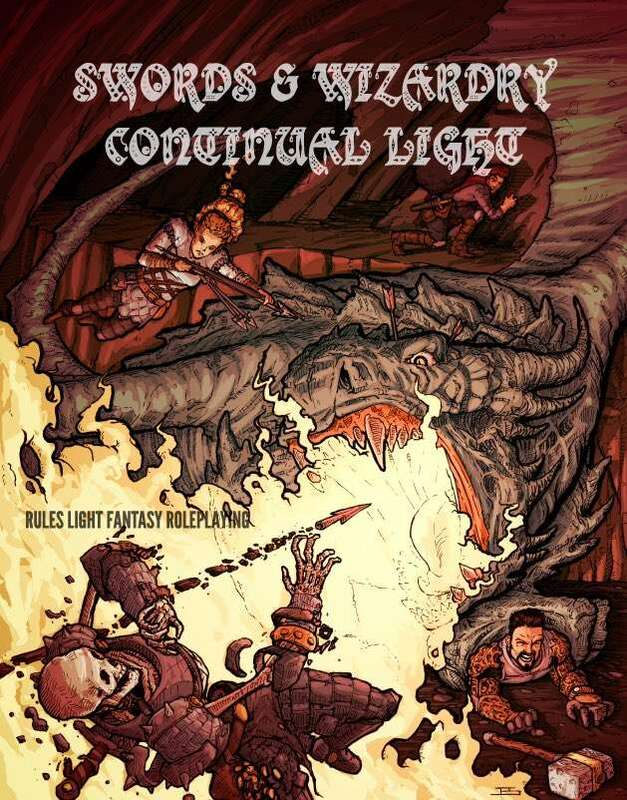 Tenkar's Tavern: Swords & Wizardry Continual Light 2.0 - Er, Say What!?! Swords & Wizardry Continual Light 2.0 - Er, Say What!?! There was a survey and discussion over at the S&W Continual Light Google Plus Community about what folks would like to see in the future for SWCL. Overwhelmingly folks what to see a better, more professional laid out version. I wholeheartedly agree. I am not a layout guy. It is not one of my skill sets. While the layout of the current version of SWCL is certainly serviceable, it doesn't have that "pop". Additionally, a new layout would probably have embedded fonts, allowing for print copies at RPGNow and Lulu, not just Amazon. In truth though, I want more than just a better layout. So the plan is to include seven two to three page adventures in the back of the rules, one for each level of SWCL. This should bring the page count to about 32 to 36 pages or so. I've got 2 adventures in hand and a good idea of who to ping for the rest. I'm guessing the PDF cost goes up to $2.95 with current owners of the PDF getting a free update of the PDF. So, no rules change or aditions? Also if yes, what would be the time frame? I'd love to see something drawing upon Norse mythology and themes, but that's TOTALLY a personal bias. Setting is beyond the scope of SWCL. Would need to be a SW campaign book. Maybe a hexmap or something OSR'y? I can do a 50 mile by 60 mile area in 4 pages with 20 or so locales and a paragraph or two of background. Explanation of unarmored base AC is missing IIRC. If you are still looking for someone Erik feel free to send me an email at a dot c dot gale at gmail. Did you want black and white still or is color an option? Is this the best place to look for updates on SWCL? I just downloaded it man and it might be the perfect OSR. Great job. So I'm definitely looking forward to version 2.